It’s December, 1968. 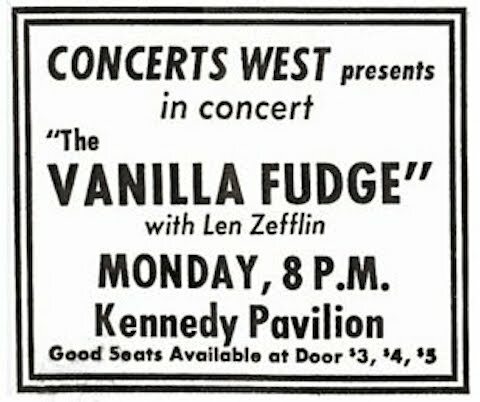 You’re a teenaged kid in Spokane, Washington, keen to see Vanilla Fudge—or “The Vanilla Fudge,” as the promoter calls them—at Gonzaga University’s Kennedy Pavilion, and… what’s this? The opening act is “Len Zefflin?” Who the hell is that? Maybe you’re hip, like Bob Gallagher, who knew Jimmy Page from the Yardbirds and looked forward to catching his new band. Maybe not. Maybe, like Kerry Whitsitt, you’re hoping “the first band wouldn’t stay on stage too long.” You know how it is… opening bands…. These then-teenage fans’ reminisces of this historic show, only the fifth of Led Zeppelin’s first U.S. tour, come courtesy of the Zeppelin website's description of the mistakenly billed “Len Zefflin”’s earliest recorded concert, which you can hear in its entirety above, thanks to an enterprising young student who brought his tape recorder. The band’s first album---Led Zeppelin---wouldn’t hit stores for another three weeks. The kids haven’t heard anything like this before: Bonham’s explosive fills, Plant’s high-pitched harmonizing to “Page’s pipe-wrench riffs.” By the time Zeppelin left the stage, Bob Gallagher and his buddies were “flabbergasted.” And “when Vanilla Fudge came on, they were so sleepy. It was like, after that, psychedelia was dead and heavy metal was born, all in a three-hour show.” Poor Vanilla Fudge. The raw, two-track tape recording of that frigid winter show has circulated for thirty years in various bootleg forms, but it’s new to Youtube, new to me, and maybe new to you too. Listen to it and see if you can’t conjure some of those lucky audience-members’ awe in that moment of discovery, when heavy metal was born from the blues. The full tracklist of the show is below. For the full experience, see the Youtube page to read a transcription of Robert Plant's between-song stage patter. A lucky find indeed! I blenched at the sound quality…then kept it on while I ‘did some stuff’. By the third track, I was hooked and hungry for more. Such sensual music! Such a confluence of influences! Wow! My DAD was 18 when this took place and I think LZ is the GREATEST band of ALL time. The quality is pretty great for a fan made reel to reel recording done over 40 years ago. It is unfortunate that there are no circulating recordings of Led Zeppelin’s first tour in Europe while they were billed as the New Yardbirds earlier in 1968 but those recordings may still come to light one day. Remember John Lennon’s Quarrymen recording from the 1957 concert where he met Paul McCartney, surfaced some years back and is now owned by Capital Records. Same for a Doors concert recording from February 1966 which is still waiting to be released. All that said, Led Zeppelin sounds has always been a great interpretation of Black American vernacular; the Blues, Zydeco and Jazz. When American teenagers were oblivious to Black music in the 1950s and early 1960s most British teens were informed and armed with working class blues. This is far from Led Zeppelin’s first show. It is however, at least at this point, the earliest show available in recorded format. Their first show was in Copenhagen Denmark on 9/7/1968. OMG. Someone clean up this audio. It’s all over the place. Blown out vs. crystal clear (with the volume turned low). I saw them Oct 1969 Boston Garden.I was 17, and to this day, after lost count of how many concerts, that show left an indelible impression of sheer ecstasy, raw rocking bluesy chills, never forget it.